Teachers in professional development sessions, discussion forums, and informal conversations often recognise that there are issues affecting their learners’ attention and learning, despite their best efforts to design and plan clear, concise, interesting, engaging, purposeful, and meaningful lessons. I’ve frequently heard teachers, novice and experienced alike, searching for ways to make their classes more engaging and for more of their learners to make sense of more of the concepts presented to them at a time. Personally, I think that most teachers are very good at directing, instructing, describing, demonstrating, and explaining, and they’re often skilled, likeable, and entertaining presenters. 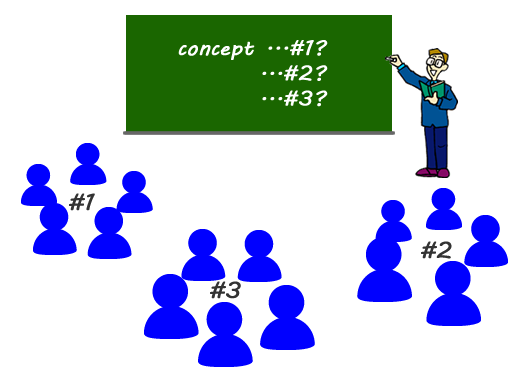 I don’t think that teachers’ presenting abilities are the problem… …let me explain why. Among any cohort of learners, even when they’re grouped according to their prior knowledge and abilities, there’ll be what Daniel Willingham terms variation in preparation (Willingham, 2009), i.e. that some learners know and can do more than their peers on particular tasks and problems. This is particularly clear in subjects such as Mathematics where concepts (facts and procedures) are logically extended from others; understanding calculus requires understanding trigonometry, which requires understanding geometry, which requires understanding algebra, which requires understanding arithmetic. However, it’s more complicated than that. The learner also has to have a sufficient grasp of the language and linguistic reasoning concepts that we use to reason our way through and make sense of mathematical concepts and ideas. Children can only manage the complex, logical reasoning required for areas of mathematics when they’ve acquired the linguistic skills to manage and direct their thinking in this way. In this respect, language is the tool that we use to think with. New Dorp high school, New York, apparently demonstrated this when they raised their learners’ previously poor performance on math and science tests by emphasising developing their linguistic skills in math and science classes², the researchers cited learners’ linguistic development as a strong contributor to their improvements in academic performance. (A well known aspect of task and test preparation is to draw attention to the “wording” of questions, tasks, explanations, and descriptions). Therefore, to tackle a maths problem, learners not only need prerequisite math skills and knowledge, they also need sufficient literacy skills and knowledge. Some learners will already understand the concept and be able to complete any tasks and solve any problems that they may be assigned; for them, the class is, at best, further practice and consolidation but more than likely unproductive time. Other learners may not be prepared to make sense of the concepts being presented; for them, the class is confusing, frustrating, and not engaging. 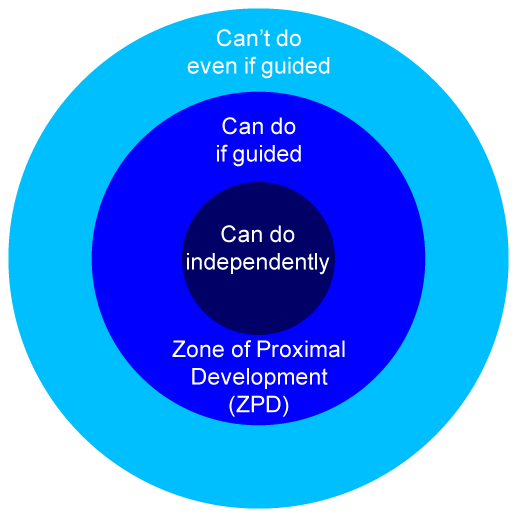 For those that are left, often a minority, find that the presented concept is within their Zones of Proximal Development (ZPD), and the class is a valuable, rewarding, and productive learning experience. Given another concept in the same class, the variations in learner preparation may shift in unpredictable ways. A learner that was previously in their ZPD can find themselves suddenly confused and frustrated. Taking our math examples, they may understand the prerequisite math concepts but not have the linguistic skills to tackle the next one being presented, or vice versa. Clearly, the teacher-led approach only usually serves a minority of the learners in a class at any given time; it’s an inefficient, hit-and-miss way of helping learners to understand and make sense of concepts that tends to result in boredom, confusion, frustration, and deficits in attention in most classes. Clearly, preparing one lesson to present, in a one-to-many fashion, to a whole cohort of learners which are at different levels of preparedness for any given concept, will inevitably give many, if not most, learners an unrewarding learning experience at one time or another. That the teacher is teaching a concept, and I’ll assume that the teacher is doing it well, doesn’t necessarily mean that her learners are learning it, and it’s not necessarily because of any failure on the teacher’s or learners’ part. and/or social reward – They like their teacher and/or their classmates and enjoy spending time with them. A one-to-many, expository approach is just one way to teach. It places the teacher not only in the role of “class leader” but also in the role of supervisor. Not only must she lead her learners and inspire them to learn, she must also direct their learning activities, step by step according to her lesson plan. At each step of the way, learners are dependent on their teacher’s direction and instruction of what to do next. There is little or no time for her to attend to the individual needs of learners and they have to either follow the lesson plan or get left behind and perhaps try to catch up later. They don’t even need to know why they’re doing it or what it means, as long as they follow the instructions correctly. Unfortunately, facts and procedures can be memorised by learners and repeated in tests without ever bringing them to life, giving them meaning, and really understanding them — Our minds have great difficulty in remembering facts and procedures that we haven’t understood. A learner-led classroom cultivates a climate where learners can take responsibility for their own learning. The teacher’s role as leader is to provide the stimulus, what the learning objective is, any resources that may be useful, and allow the learners to seek the help they need and decide/discover how they can best learn it (If you’re a fan of Latin, the what is the syllabus, literally meaning “list”, and the how is the curriculum, literally meaning “the course of a race”). A typical approach is to put learners into smaller sub-groups of no more than five and to work on tasks, problems, and projects as teams. Members of a learning team succeed together, working on their individual strengths to the benefit of the whole group. Learners can also adopt specific roles to play during a learning activity, as in the case of Reciprocal Teaching’s reading for understanding activities, which shares the cognitive load between members of a group allowing for more complex tasks, requiring greater collaboration, and promoting deeper learning. Learners who already understand a concept can help those who don’t yet, and as Dr. Matthew Lieberman has noted, learning a concept in order to teach it to a peer is a strong social and cognitive motivator⁴ (Peer teaching was very successful in the Écoles Mutuelles during the French revolution when there was a dire shortage of teachers, and popularised in the UK as the Lancasterian and Madras systems). 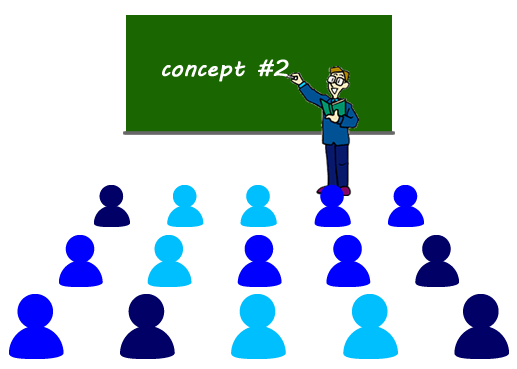 Additionally, if one group gets stuck on a particular concept, they can ask another group for help. In this way, all learners are working together purposefully and meaningfully, always aware that they may be called upon at any time to help their peers to understand a concept. 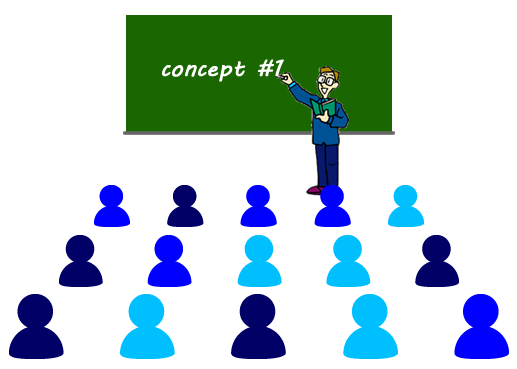 In this setting, the teacher spends less time instructing and directing learners and typically adopts multiple roles as a monitor, moderator, guide, and/or mentor with individuals, groups, or the whole class, depending on what any particular interaction or intervention she feels would be most productive and conducive to independent, self-directed learning. What are some examples of self-directed learning? In K-12 education, studies on Reciprocal Teaching have reported strong learning gains. Here’s a teacher oriented introduction to the method. Here’s an interesting paper, Simmons, A. M., & Page, M., Motivating Students through Power and Choice, that examines self-directed learning. Part of the reason some “flipped classrooms” have reported success is that they provide classes with time and space to work together in small groups on tasks, problems, and projects informed by the presentations, readings, research, etc. that they do in preparation outside class. Please note: These are just a small sample from a long and growing list of courses and programmes with strong orientations towards collaborative, self-directed learning and teaching practices in classrooms around the world. How does this relate to online learning? Many of the stock tools of modern online and distance learning and learning management systems are designed to facilitate collaborative participation and group work among learners; discussion forums, chat, wikis, databases, concept mapping, Etherpad (similar to Google Docs where learners can see each other edit pages in real time), etc.. The tools are available to teachers, faculty, resource developers, and curriculum developers but, with the notable exception of discussion forums, I’ve been surprised at how infrequently they’re used to this end. As with face-to-face learning and teaching practice, online learning and teaching practice tends to engage with only a small sub-set of traditional, orthodox learning and teaching theory. For those teachers, faculty, curriculum developers, and academic management that are interested in exploring and developing learner-centred, collaborative courses and programmes, one of the most influential and frequently cited evidence-based models is the Community of Inquiry framework, which places a strong emphasis on social connection and collaboration between learners. Does this mean we should never use direct instruction? Certainly not. I prefer to think of direct instruction as just one of many tools available to teachers, and all tools have their appropriate uses and limitations. There are times when teacher-led, direct instruction to a cohort of learners is an appropriate choice and some amount of direct instruction can improve group cohesion, and be motivating and even inspiring to learners. However, I think problems arise when it’s the dominant or only method that teachers and faculty use and it’s the combined responsibility of teachers, faculty, curriculum developers, and academic management to work together to ensure that courses and programmes are using the most appropriate methods and approaches to meet learners’ needs in achieving their learning objectives. Although the proportion can vary from discipline to discipline and subject to subject, if you’re spending more than 20% of classroom time on direct instruction, I recommend reviewing what other methods could be more appropriate for your courses’ and/or programmes’ learning objectives. ¹ Willingham, D. T. (2009) Why Don’t Students Like School?, A Cognitive Scientist Answers Questions About How The Mind Works and What It Means for the Classroom, pp. 21 – 22. Jossey-Bass. ³ Quoted from Krechevsky, M., Mardell, B., Riverd, M, & Wilson, D. (2013) Visible Learners: Promoting Reggio-Inspired Approaches in All Schools. Jossey-Bass, citing Michaels, S., O’Connor, M. C., Hall, M. W., & Resnick, L. (2010) Accountable Talk sourcebook: For classroom conversation that works (PDF download). Pittsburgh: Institute for Learning. ⁴ Lieberman, M. D. (2013) Educating the Social Brain, Social: Why Our Brains Are Wired to Connect, 1:12. Crown Publishing. Lieberman found that a learner who studies a concept with the intention of teaching it to a peer, even if she doesn’t teach her peer, learns it better and performs substantially better on tests that a learner who studies for a test.